Well, I'm glad there are some others out there who have the same appreciation I do for the Tour de France. Now starting its second week, the tour takes a long road through the Pyrenees, but never actually crosses into Spain or the Basque. Stage 8: Figeac to Toulouse - We now come into a region of France that has a few more breweries. 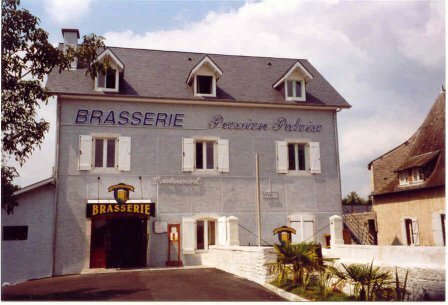 On today's flat stage leading into the Pyrenees, the peloton will pass right by Les Freres Brasseurs in Blaye Les Mines. If you happen to there on July 12, you can watch the tour go by from the pub. Les Freres Brasseurs has two beers, a wheat blonde called "Tarnea", and an amber called "Tolosa." No reviews up on Beer Advocate, but RateBeer is unimpressed (Tolosa, Tarnea). Once in Toulouse, 300 yards west of the Platz Wilson, and a mere 600 yards from the Stage 8 finish line, is Brasserie Frog & Rosbif, one of a collection of FrogPubs. Timeout here for a minute: FrogPub? The English have invaded France and are taunting them! Apparently the large wooden badger had better success than the rabbit. The Frog & Rosbif is an English pub put smack in the middle of Toulouse, complete with dart competitions, rugby matches, and a full line of English-style beers with generally favorable reviews (RB. BA.). The Ginger Twist sounds like something straight from Leinenkugel's: "What happens when you reduce the hop content & make up the difference with ginger, lemon & lime? A deliciously-refreshing cold amber beer with a fizzy twist!" Stage 9: Toulouse to Bagneres-de-Bigorre - the first of the true mountain stages, the chain-microbrewery theme continues about 5 miles to the Southwest of Toulouse in Labege with Les Trois Brasseurs. Rumor has it that there is a brewery along the way, in Borderes Louron, but there seems to be no information about it. Ah well. On to stage 10. Stage 10: Pau to Hautacam - Today is the shortest non-time-trial journey, a mere 156 km (about 97 miles) that features the brutal 17km (10.5 miles) climb of the 7.4% Col du Tourmalet and a 7.2% uphill finish. The good news is they are off tomorrow; the bad news is there is no beer along the way. However, the off day, Tuesday, is back in Pau. Perhaps with the off day, folks might want to head three miles away to Lescar, to Brasserie Pression Paloise. For a mere 20 Euro (about $31), you can get a 5L "growler" of the blonde, blanche, or ambree; 30 Euro (about $46) you can get a 5L "growler" of the Speciale Blonde, brewed with honey and green apple liquor. Stage 11: Lannemezan to Foix - This nice day back runs right past Brasserie Artisnale d'Ariege Pyrenees. Ariege-Pyrenees makes four beers: a blonde ("La Brouche"), an amber ("carabell"), a blanche ("Plume"), and a brown ("Magie Brune"). All of which are un-pasteurized and unfiltered. Of course, these last few breweries, which appear to be pretty decent breweries, present one of the problems of the French beer: none of it is available here. There's the infamously bad Kronenbourg 1664, made in Strasbourg, that isn't exactly making people clamor for biere francois. A few of the French microbrewies are managing to make it into the country, but availability is very low. Stellar foreign microbrewery importers Shelton Brothers have managed to find a few French breweries to bring into the country. But these breweries are all along the Belgian border, where, unfortunately, the Tour will not be going this year. Tops among these are La Choulette, Duyck (the "Jenlain" beers), and my favorite, Thiriez. La Choulette and Thiriez have decent availability here in Madison, though only a few of the styles, so ask around for them. Jenlain's Noel was on-tap at Maduro back around Christmas, but I haven't seen any of it in bottles or on tap since. Stages 12 & 13: Lavelanet to Narbonne to Nimes - two long flat stages that get the riders out of the Pyrenees and along the French coast of the Ligurian Sea between its border with Spain and its border with Italy. There are two breweries along both of these stages, both of which are in Stage 13, the first (Brasserie du Pays D'Oc) at about the halfway point and the second ("Micro Brasserie Pilote Viti R&D") shortly before the finish. Taking the second of these two first, it is a research brewery of plant genetics company Stapht and its beers are not available commercially. As for the first, all (both) of the beers available as Pays D'Oc are 100% organic; all are bottle-conditioned, unpasteurized, and unfiltered. They specialize in two styles: the French bier de garde, and the Belgian saison. So, that's it for week two of the tour. Next week we'll finish it off with some breweries along the Italian border in the Alps and finishing at the Champs Elysees in Paris. "one of the problems of the French beer: none of it is available here" - now you tell us! Well, I guess we'll just have to plan a tour-following, 3 week bar crawl for next year. Regardless of the availability, thanks for the great info! Nice Monty Python allusion. That is to be read knowing I am rolling my eyes while typing it.